So I’ll say now this page shares my Nepal Everest summit attempt and I was not successful. I turned around after several things had gone wrong that day. If you read the rest of this page hopefully you’ll understand why. If you’re simply interested to see the top of the world then you can click here to see my successful return of my climb Everest from Tibet. Except for when I was sick with a fever in the beginning of the climb, I had felt very strong the entire trip. 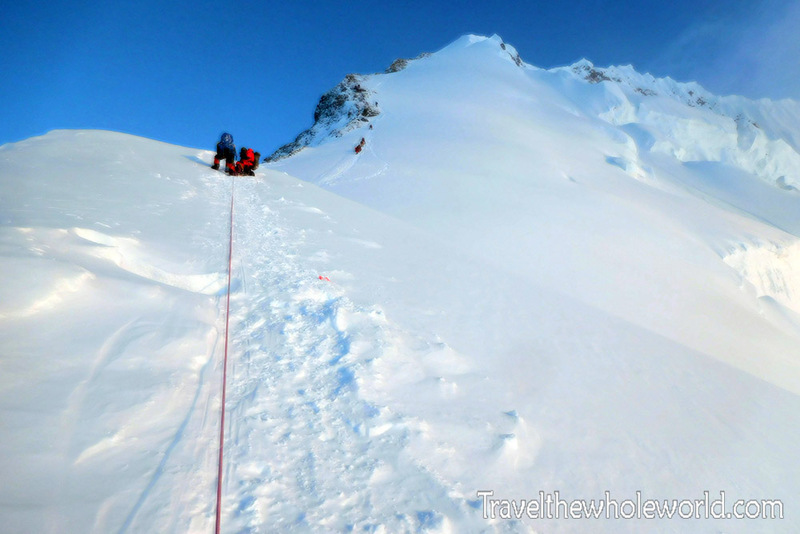 Our trouble started when we arrived to the South Col or the mountain’s highest camp on the Nepal side. We didn’t know the details at the time, but heard that one climber had run out of oxygen and died and another had gone to sleep in his tent and was found dead an hour later. 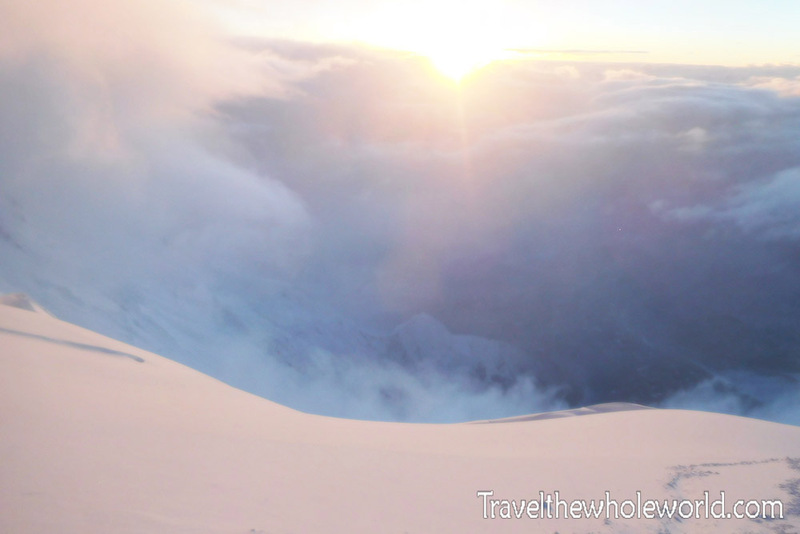 Summit day begins from the Camp IV in the South Col, which is located in the death zone at 8,000 meters or 26,300 feet. From here many basic functions of your body stop working because of the lack of oxygen and low pressure. It’s extremely difficult to sleep and eat. Breathing oxygen from a tank reduces these effects but only by a small margin because the atmospheric pressure is so low. Before I started off for the summit, my oxygen saturation in my blood was terrible, around 57%. When I stepped out the tent I realized that my face was all pins and needles. I had no idea if the numbness was superficial or was something more serious going all the way to my brain. There was only three of us climbing today, and we had started off at different times heading up in darkness. It was a planned 18 hour round trip give or take a few hours. I tried to bring in all my mental strength together and push myself for what might be the hardest night in my life. The people who had lost their lives the night before were on all of our minds. On top of facing the issues they had I was also worried about the weather. We knew a storm was coming but it was supposed to be stay below us at 23,000 feet (7,000 meters). Almost right after we started climbing though, it got a bit windy and shortly thereafter we started to see heavy snow. The photo below was taken on our way up to the top of the world, just outside of Camp IV. As we continued the ascent I was shocked by how so many people had problems so quickly. After about an hour or so I was being asked for help by people who were already turning around coming down the mountain. Two climbers were too tired to untangle their ropes and just wanted me to switch their safety line. Another climber had his rappel device on a frozen carabiner and was unable to use it. I took out another carabiner and hammered at it trying to break up the ice that had built up in the threads. Twice I told him it wouldn’t work and I couldn’t fix it, but kept hammering it away and eventually freed it up for him. The group was tired but continued down the mountain, only a few hours from Camp IV. 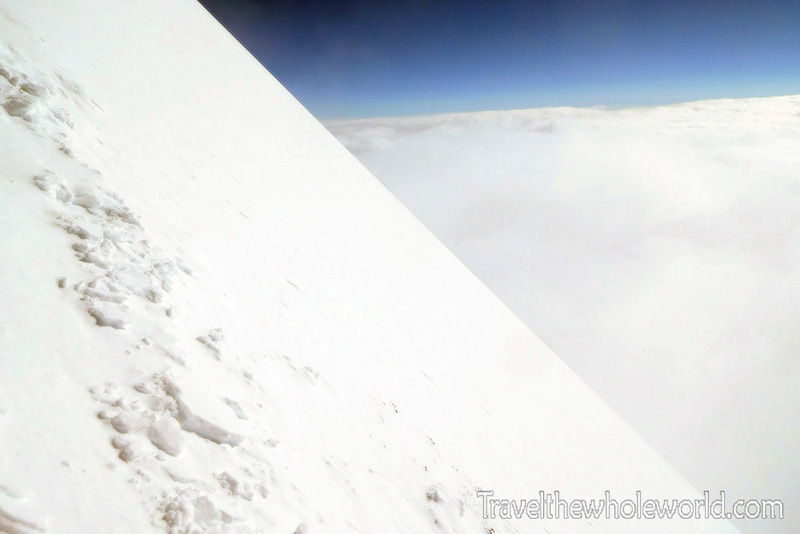 As I continued upwards I reached an elevation of 27,500 feet (8,400 meters) and came across my worse nightmare. There was a climber upside down on the ropes with what looked like both cerebral and pulmonary edema. He was coughing up massive amounts of fluids while his arms would randomly reach out every now and then. Some people who have early cerebral edema and are conscious are not even aware where they are. I heard of one guy who was approached and he didn’t realize he was on Mt. Everest but thought he was on a ship at sea. This guy’s mental state was so deteriorated I wasn’t sure if he was even aware of my presence. 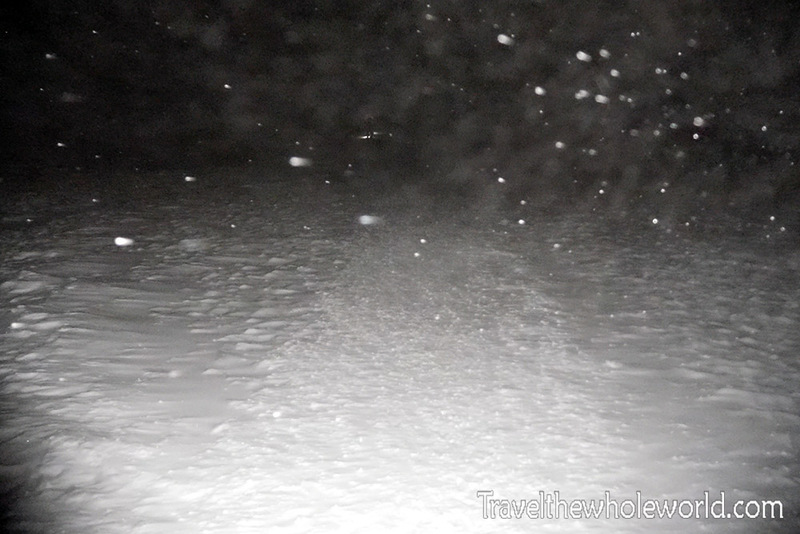 The snow was blowing in really hard and the ambient temperature was about 30 degrees below zero. His oxygen mask was off, and some of this clothing such as his gloves were missing. Aside from the altitude problems he was definitely suffering from hypothermia as well. I knew he was beyond help, but the expedition leader had given me all the emergency medicine so I felt obligated to try something. I tried to swing his legs below him and make him sit upright. With his random movements it was an extremely exhausting task. I was able to get his legs down but not his body up. There was so much fluid coming out of his mouth I wasn’t sure how I could get the medicine down his throat, and realized if I did it was not as if he would stand up and head down the mountain. He seemed to be minutes from death. While I was there trying to get him upright a Sherpa from our expedition caught up to me. Once he saw the situation he told me told me in his limited English “No problem, no problem,” meaning nothing could be done. Not sure what else to do, we reluctantly passed the poor man as everyone else had done. I was grateful to not see anyone else in that condition. Mentally I was shaken up by the dying climber but physically I still felt strong. A short time later we were at the balcony and exchanged oxygen bottles. From here I was only four or five hours from the summit and was completely confident I’d make it to the top of the world. The photo above is me sitting on the balcony and you can see the weather was still windy and snowy. Of course it was also extremely cold, but I could see light in the distance as the sun began to come up. Right after the balcony not only did the sun come up but the weather changed. We had clear skies above us and the only clouds below us were along the Tibet side of the mountain. Two climbers who had already summitted were coming down and talked to me. They had left in the afternoon rather than at night and reached the summit at 2:30am. We took this opportunity to exchange photos. Above is myself with my Sherpa. At this point I felt it was just simply a matter of time for me to reach the summit! An hour later I suddenly began to feel weaker and dehydrated. At this point the weather was getting worse and we were moving through occasional white outs. One last team who had departed much earlier than we did were coming down the mountain. One of the climbers was clearly worried about the changing conditions. He pointed to the weather and put both of his hands on my shoulders. “Did you see all the dead bodies down there!? Go back!” I lied and said I was only going to go a little bit further while I had full intentions to finish the job. As I cautiously continued upwards I could see the South Summit just ahead. The general rule is to reach the South Summit of Everest before 1:30pm, and it was only 9am now. Since I was still four hours early I had plenty of time left. I drank some water and ate, and while I wasn’t feeling very strong anymore I still felt reasonably well. Soon after the storm seemed to be coming from below and was rapidly moving up the mountain. Each step I took seemed to increase the worse weather. I looked back at the ridge we had just climbed and could see the wind and snow racing over it. If we had a nice sunny day without question I would have finished the final few hundred feet, but too many things had gone wrong in the past 24 hours. I just had a bad feeling that nothing wasn’t right with anything this day. I made probably one of the hardest decisions in my life. Just an hour away from one of my biggest dreams I decided to turn around. Like all mountains regardless of the conditions once you head down its a matter of survival. Needless to say I no longer took any pictures that day. Aside from the Sherpa with me, no one else was around and I had the entire mountain to myself. With no one above me, I was the highest person on planet earth. On my decent I ran into another one of my teammates and good friends. We discussed our options and I explained that I felt that we were playing with our lives. We made a decision to try to contact our expedition leader for a weather update. If it was expected to clear up we could continue. I was suddenly refilled with a surge of energy, I was going to climb Mt. Everest after all! Using the radio we weren’t able to get a response. Several times we attempted to make contact, with anyone, but just radio silence. We were heading down after all. By the time we descended to the balcony we were in the major snow storm again. My friend’s Sherpa had an oxygen problem severe enough that he talked about possibly needing rescue. We were able to exchange his oxygen which seemed to remedy the situation. All four of us were weak descending, but as we went below the balcony I suddenly found myself going incredibly slow. It was like a switch just went off in my body. I was going so slow that the next thing I knew I was completely alone in the storm and could only see a short distance in front of me. It seemed impossible to take even a few steps, and even worse I was beginning to have irrational thoughts. It was like dreams were trying to force their way into my mind. It’s a bit hard to judge your own sanity when you’re alone in the death zone. I had no idea how bad my condition actually was or why it suddenly came upon me. I did some basic math problems in my head and found that part of my brain still worked. Our expedition leader had shown me a trick where you close your eyes and bring your index fingers together. If you can hit them you’re fine, if not then you’re losing your motor skills. This test I failed. As I descended I found myself to be so exhausted that I tried to sit down on the mountain and simply slide. More often than not, this was a waste of time and I got stuck in deep snow. Occasionally I got enough speed that I was a bit scared I’d crash into a rock or even worse my oxygen bottle would fly out of my pack and go down the mountain without me. I had secured my first oxygen bottle to my pack with a carabiner. The second one I had not so if it fell out of my pack I’d certainly not survive. Despite the risk and the fact that this would take 30 seconds to fix, the idea of removing my backpack was overwhelming and left things as they were. As I slid down the mountain I passed just inches by the climber who had pulmonary and cerebral edema. 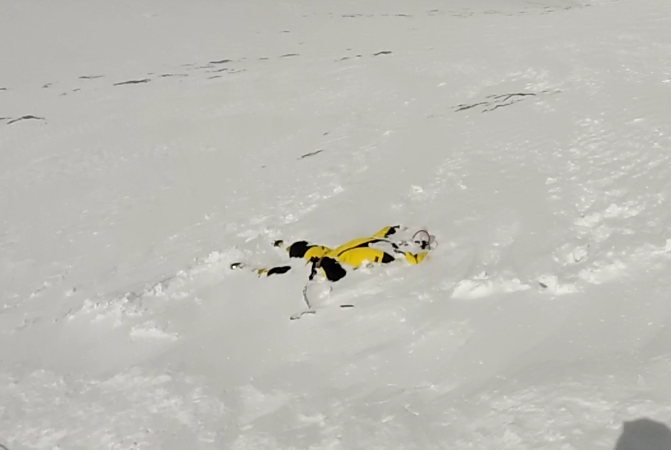 He was dead now and nearly completely buried in snow. Clearly at one point he was in my condition, extremely exhausted and beginning to have irrational thoughts but still able to move. I began to question if I should take the emergency medicine myself, and at this point I realized there was a serious chance I might not survive. I was completely alone in a snow storm in the death zone, dangerously exhausted, and slowly losing my mind. I decided to change tactics which probably helped save my life. Instead of sliding down which sounds easy but was actually inefficient, I decided to rappel down everything I could. The terrain was very steep, but most people wouldn’t bother rappelling down half the terrain that I was in. In my case I was letting gravity do all the work and I was able to make rapid downward gains while using little energy. I even caught up to the team we had seen at the balcony and found many of them looked to be struggling as well. When I was right behind their last member I realized something terrifying that explained my extreme exhaustion and incoherent thoughts. I truly thought I was dead at this point and I even yelled out to the guy in front of me, “I’m going to die!” He turned around and saw also that my oxygen line was broken off. Not only was I not breathing oxygen, but I still had the mask on my face which was further restricting my breathing. I would have been much better off without my oxygen mask on the past few hours. I seriously expected him to ignore me and keep going, but thankfully he stopped and used a knife to cut and remount the line. I thanked him but he had only a warning for me, “If you want to survive do not stop.” I went against his advice and decided to rest. I was aware that I was in a panic, so I thought it wise to sit for a bit, breathe in some oxygen, drink water, and eat so I could continue with as much of a level head as possible. With the snow blowing in it didn’t take long for them to disappear and I was all alone again. My little break helped and I was able to continue down more efficiently. The rest of the descent took an incredible amount of effort and there were still a few times were I questioned again if I’d make it or not. When I was close an incredible thing happened. I saw a man standing for no reason in the middle of the storm. At first I thought I imagined it, but as I got closer I saw he was real. “I heard someone was on the mountain still”, he said and gave me a cup of hot tea. He warned me I had one minute to drink it. As I thanked him between sips a minute must have passed because he snatched the cup away before it was halfway finished and disappeared back to camp. As I continued I was worried I had missed it and got lost. It wasn’t until I was right in front of the camp that I could see the yellow tents. After being gone from camp for a total of 20 hours of non stop climbing I stumbled back into my tent at the South Col and collapsed. As I laid there completely wasted I realized I still had to get down the mountain. All I did today was get to the South Summit and return to Camp IV. I still had the Yellowband to cross, down the Lhotse Face, the Western Cwm, and then the Khumbu Icefall to deal with over the next few days. 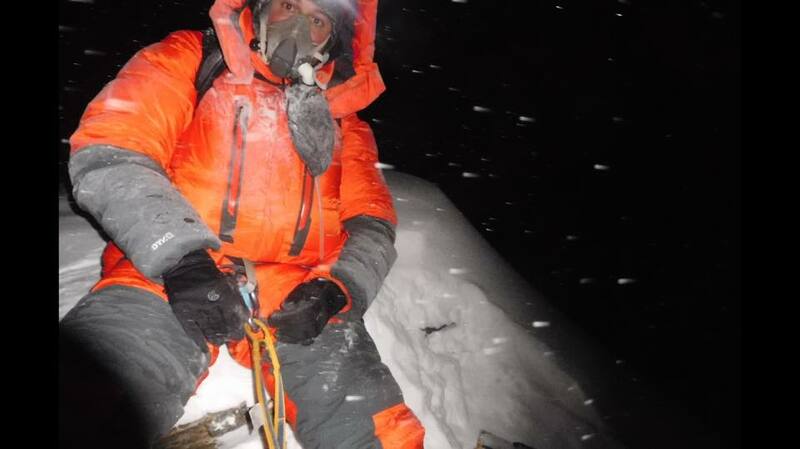 The next morning I found out while I was struggling to save myself, one of my other teammates who I hadn’t seen at all that night had encountered some people screaming for help and heroically given up his summit attempt to bring them to camp. One of them he got back to their tent. The second climber he helped to just 150 meters from the South Col where the man collapsed and my friend was too exhausted to help anymore. That climber somehow was still alive the next morning but died soon after. The other climber he saved might lose a hand from frostbite, but survived. As I went down in sunshine the next morning I figured the worst was over, but just 15 minutes outside of Camp IV I passed by two more bodies buried in snow. I thought maybe they had died trying to reach the South Col, but later learned they were actually trying to leave the mountain. I never quite understood how they both passed away so quickly after leaving the South Col. These pictures were taken with my GoPro as I went down the mountain and had video recording. I really debated putting these photos on my website for those that lost their lives. I decided to since I’ve always taken a journalistic approach and simply post my experiences here good and bad, especially since they are not recognizable. Despite feeling much better than the day before I was still worried about making it down myself. Each step I took into thicker air I felt stronger and more energized. I thought I wouldn’t make it to Camp III, but after I reached Camp III I felt strong enough that I skipped it and went all the way to ABC. Once I was reunited with others from my team we heard there were rumors of someone writing an article called a ‘Bad Day on Everest’. I never was able to find it once I got back to civilization, but was surprised to see many articles blaming inexperience and overcrowding on that night while none of those seemed to be factors. As a matter of fact, the three of the climbers who had died had been to Everest at least three times already, so I’d expect they’d understand the mountain and high altitude climbing very well. It seems that some have a belief that Mt. Everest is a very safe place and if something bad happens then clearly someone is to blame. The motivations for wanting to climb the mountain is an entirely other topic. All I can say for now is that despite what happened my dreams of reaching the top of the world haven’t changed and I will most definitely return.